This is a great book. Its basically two autobiographies of two major figures of the Zanzibar Revolution and Zanzibar postcolonial politics, pulled together with an introductory essay by G. Thomas Burgess (who also edited the book). In the 1930s(and even now), however, Zanzibar Town was divided into two main areas, Stone Town and Ng’ambo.The well-to-do people lived in Stone Town, and the less well-oﬀlived in Ng’ambo. Ng’ambo started as a poor man’s land on the other side of the creek from Stone Town.That is what Ng’ambomeans in Swahili,“the other side. ”Stone Town had stone buildings three and four stories high, but Ng’ambo mostly had ground-level buildings constructed of mud, cement, and thatch.The more prosperous had roofs made of corrugated iron. Mostly Arabs and Indians lived in Stone Town; very few Africans lived on that side of the creek; they would come for work in the day and return to Ng’ambo in the evenings. Ng’ambo was more ethnically mixed than Stone Town. There were Arabs and Comorians living near the creek, but the further you went into the interior,the more Africans you encountered. As a young boy, I was rather naughty. I would not be bullied,and despite my small size, I was often chosen as a leader. As children,we played ping-pong,cards,and dominoes. We also went swimming, but sometimes my mother would beat me because she thought I was going to drown. At high tide,we would jump oﬀ the waterfront at Forodhani or in front of the old English Club. Cinema was also very popular in those days. We’d go to the Majestic Cinema, the Empire Cinema, and the Sultana Cinema. I saw Bogart, Sinatra, Dorothy Lamour, Ava Gardner, and Elizabeth Taylor. I liked Western ﬁlms more than Indian ﬁlms because I could not understand what was happening in the Indian pictures. I spent most of my years attending primary school in the home of my grandmother in Ng’ambo. She was verystrict, tidy, and clean; she would sweep outside the house, and anyone who came, she would chase away. She had the cleanest toilet around, which everyone in the neighborhood knew about. Since she once lived in the sultan’s palace, I used to walk and play in the palace, but I also played with the local African boys. I had no established roots and no allegiance to one part of Zanzibar Town or any particular racial community. I was proud of myself and of my family, but not of my race. I did not belong to the school of thought that Arabs had achieved great things in Africa. What had they achieved? Nothing, except the accumulation of wealth for some and poverty for others. Whatever progress was achieved in Zanzibar was the product of historical accident. Once when I was veryyoung,I dreamt my grandmother took me to Pemba and introduced me to old ladies standing in a vast clearing, all with their earlobes pulled down to their shoulders.This was at Giningi, a place famous in Pemba for where wachawi [witches] like to congregate. There, in front of that gathering of wachawi, she asked them to protect me from evil for the rest of my life. In the morning, I told her about my dream, and she said “Shhhhhh, don’t tell anyone.”I was very young, an innocent boy less than seven years old, but since then I have been a survivor. My friendship with [Abdulrahman Muhammed] Babu began at a very early age. Babu, who became the brains of our political struggle here in Zanzibar, was several years older than I and lived just across the alley from our house in Malindi. He would tease me whenever my family served rice because he could see I liked to eat ukokoand matandu, which was the rice crust that would collect on the earthen pots after boiling. I liked to dip the rice crust in curry,but Babu would joke with me about that because normally people would not eat the matandu; they would just leaveit for the servants. Knew how my mother managed to support us; maybe she received money from her boyfriends. I never asked. I think that is why later I became more sympathetic with the working people, because of that experience of hardship. It was during the war that racial discrimination became very apparent in Zanzibar. According to the colonial rationing system, the Africans did not receive any imported rice or bread, but the Asians and Arabs got rations of rice and wheat ﬂour of equal quantities. I remember because my mum sent me to the shop with the ration card. Because of this system, I think the British were responsible to a great extent for racial prejudice in Zanzibar. If, when the British came, Arabs were already predominant, they continued Arab dominance for their own ends. I have bought this book and found it a fascinating read. Anyone who wants to learn more about Zanzibar during the years leading up to the Revolution of 1964 and after should get it. 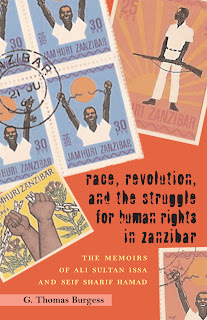 It is full of interesting reflections on the challenges that faced Zanzibar.